Unique package design for battery provides extra assurance for battery safety. The transmitter buzzer receives the voltage status of the drone will send out beep sound once the drone is in low voltage, so your drone is always under control. The transmitter buzzer will send out beep sound once the remote control signal is weak or interferenced. Your flight is always safe. 7.4 Inches easily distinguished and autolock propeller. Pure nylon fibre material builds high-intensive main body, diagonal 310mm, quadratura X structure design assures center of gravity control is at the very center of the quadcopter which make flight super stable. 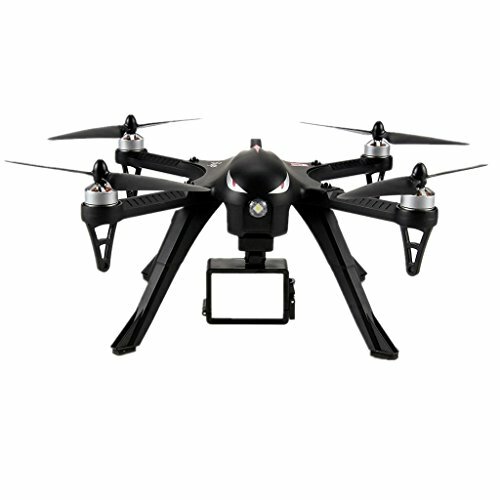 Super bright LED lights and in orientation and allow for night flying. Fly up to about 18 minutes on a single charge, using the included 1,800-mAh battery. Easily removable and extra battery safety thanks to the unique design ofits contain compartment cover. Independent ESCs Provides Worry-free Flying Experience. MJX RC is the first one and NO 1 manufacturer that added the ESC with built-in automatic lock protection and high temperature lock protection. It ends up pilot's worry about motor and ESC burn out due to dead lock. The ESCs support 2S-3S capacity li-polymer battery. Equipped with MT1806 1800KV BRUSHLESS MOTOR, ensure low friction during engine operationand reduce heat production. Better engine durability and prolong battery life up to 50% or more. Support to Mount Gopro and Xiaomi Xiaoyi Motion Camera. For your better experience, B3 Bugs has equipped with camera holder which supports to mount 5.8G C5820/C4022/C4020 camera /gopro/xiaoyi/xiaomi motion camera ( camera not included ). Combined with MJX stable cloud service, it can output smooth images with ease and provides a better photography experience for players.